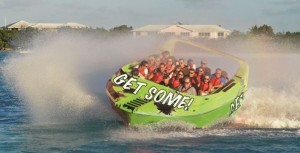 Our Jet Boat Adventures fill fast, so book your rental at the beginning of your vacation. Weather almost always plays a part in our daily operations. If weather-related rescheduling is necessary, our staff will make every effort to accommodate you during your vacation. The shore’s natural high is a phone call away. It’s a wonderful, safe and fun experience for the whole family. Book your reservation on line today 48 hours in advance and save 10%. 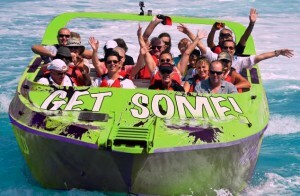 Do You Have Access to A Rest Room on Board?- Due to the performance nature of our Jet Boat her design does not accommodate a restroom. 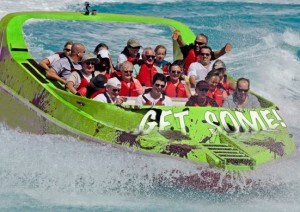 Once you are seated on “Get Some” USCG Regulations require that you remain seated for the duration of the excursion. This entry was posted in Coupons and tagged Cape May Jet Boat, Cape May JEt Boat Tickets, Cape May Jet Ski Rental, Cape May Parasailing TIckets, Cape May Wildwood Jet Boats, East Coast Jet Boat Adventure, East Coast Jet Boat Tickets, Get Cape May TIckets on Line and Save, Jet Boat Wildwood on April 25, 2013 by Ryan Reclaim.